VAN NUYS — Los Angeles City Councilmember Mitchell Englander of the 12th District on Dec. 5 recognized the 30th anniversary of the release of “The Karate Kid” during a City Council meeting at Van Nuys City Hall. 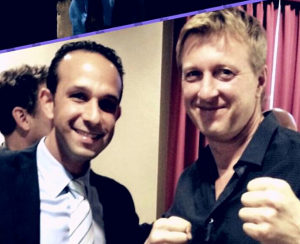 City Councilmember Mitchell Englander and actor William Zabka. The movie, which Englander called “a milestone for film and the San Fernando Valley,” starred Ralph Macchio as Daniel, the title character, and the late Pat Morita as his mentor, Mr. Miyagi. The role earned Morita an Oscar nomination for best supporting actor. Among those on hand for the celebration were the director, John Avildsen, an Academy Award winner for “Rocky,” and cast members William Zabka (Johnny) and Martin Kove (Kreese), who played the main antagonists. “This is especially significant this week, as the city continues to strive to revitalize the film industry in Los Angeles and took an important first step towards keeping coveted film and TV production in the City of Los Angeles,” said Englander, who was 14 when the movie was released. “Because of movies like ‘The Karate Kid,’ the San Fernando Valley and the City of Los Angeles became ingrained in the hearts and minds of moviegoers as the capital of the cinematic arts. Earlier this year, the Japanese American National Museum celebrated the 30th anniversary with Macchio, Avildsen, Zabka, Kove, and Morita’s daughter, Aly.